The deep dish pizza and chocolate fudge sundae you devoured the other night may have tasted delicious, but did you know that every time you consume large amounts of added sugar and fat you are compromising your digestive tract? Lack of exercise and consuming excessive calories can leave you feeling bloated, tired, and lazy—definitely not the best way to start any day! Eating prebiotic-rich foods on a regular basis is a good way to get your system back on track. Prebiotics are carbs that can’t be digested by the human body. They provide a constant flow of “food” for the probiotics, which are the good bacteria that promote a healthy digestive system. This process protects our bodies from various toxins, helps nurture the growth of good bacteria in the body, and promotes a strong digestive tract. 1. Bananas: One of the main reasons the digestive system slows down is because there is a buildup in the gut. Fortunately, bananas relax the gut and the natural fibers they contain help to promote positive bacteria growth. 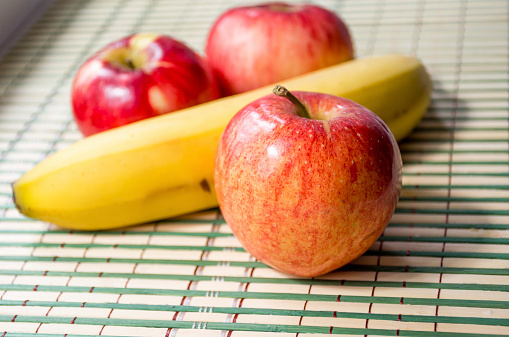 In order to get the full effect from the fiber, ensure you choose ripe bananas, as they are easier to digest. 2. Cabbage: Cabbage contains natural prebiotics and makes a perfect addition to a stew, soup, stir-fry, wrap, or salad. It contains high volumes of vitamin B, alkalizing minerals, and also offers high amounts of vitamin C.
3. Legumes: Chickpeas and green peas, for example, are high in protein, iron, and vitamin B. To complement those nutrients, legumes also provide good amounts of fiber and natural sugars that will give your gut the necessary boost it needs to create good bacteria. 4. Artichokes: They are loaded with fiber and are low in carbohydrates, which can help lower and maintain your blood sugar levels. 5. Apples: The natural pectin fiber that is found in apples makes them beneficial for the gut. The good bacteria that can be found in the gut will continue to grow, because the pectin actually feeds the good bacteria. As an added bonus, the antioxidants that apples contain are great for the heart and brain. If you don’t have the time to create a healthy prebiotic-rich meal, you can always make yourself a nice healthy shake. It is best to combine both probiotics and prebiotics in the shake. For best results, prepare the shake with yogurt or kefir—they are both loaded with probiotics and the taste will go nicely with the sweet fruit you add to it. Remember, when you add one or more types of prebiotics to your shake they will help the probiotics to grow! • Bananas: They are high in fiber and they taste fantastic. • Apple cider: Only add a smidge of it, because you don’t want the shake to taste too sweet. • Honey: Pure, unpasteurized honey is packed with natural prebiotics and will provide your shake with great taste. Combine all of the ingredients in a blender and blend until it’s smooth with no chunks. McClees, H. “The Best Prebiotic Foods for Optimal Digestive System,” One Green Planet web site, January 21, 2015; http://www.onegreenplanet.org/natural-health/best-prebiotic-foods-for-optimal-digestive-health/. Bodnariuc, D. “Probiotic and Prebiotic Shake Recipe,” Fermented Foods and Probiotics web site, February 8, 2014; http://www.fermented-foods.com/content/probiotic-and-prebiotic-shake-recipe-0.